The most recognizable face of the current Hong Kong protests is an unlikely 17 year old teenager: whose floppy hair and black-rimmed spectacles mark him out as very ordinary. His accomplishments and initiatives at such a young age, however, speak for the leader he has become, and yet: it is not his achievements or his activism that impress most; his humility and unnatural wisdom truly stand out. “Actually, this decision should be for the citizens, not Scholarism, Occupy Central with Love and Peace or others,” he says when asked about the recent protests. At 15, this schoolboy started a movement to protest the introduction of “patriotic” or “national” education in Hong Kong’s school, criticised by many including the activists as “brainwashing”. Over a 100,000 people gathered in response to the pleas of the young Wong; as he became the face of a massive movement that the authorities could not ignore. The Chinese government was forced to repeal the plan soon after its proposal, and Wong became a “political superstar”. Not that he enjoyed it: “If a mass movement turns into worshipping a particular person, that’s a great problem,” he said after that campaign. 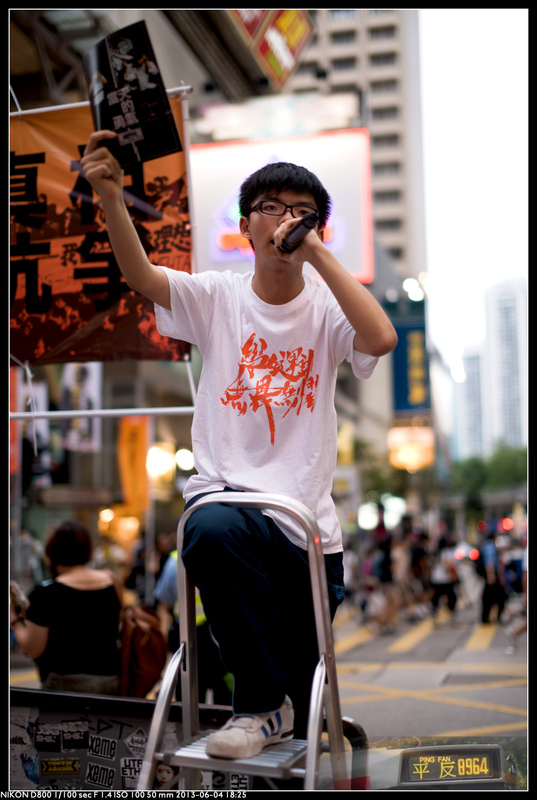 As the main student leaders who started the movement founded the activist group Scholarism, Wong’s leadership skills in being able to motivate, inspire and mobilise through his speeches and actions became apparent. It shocks some to hear a 15yr old start a protest involving thousands: but his political career started at the unbelievable age of 13. Yet he is described, by many who know him, as moderate and “measured beyond his years”. He refuses to accept credit, but also accepts he has attracted unwanted attention: he’s prepared to “see every battle as possibly the final battle”. He is very passionate too: about unbiased education of course; but also about the state of Hong Kong’s citizens and institutions, and about their right to universal suffrage (free, fair elections). Scholarism was one of the first groups to camp outside the Hong Kong government headquarters in the 2014 protests for electoral reform: and his was the first high profile arrest, which some believe was responsible for many neutral citizens to join the demonstrations.